October | 2012 | Knit & Run! October 2012 – Knit & Run! Sorry for being away so long. Between my training schedule and Alex joining the soccer team at school, trying to fit everything in became a logistical challenge like nothing else I’ve ever tried to do. 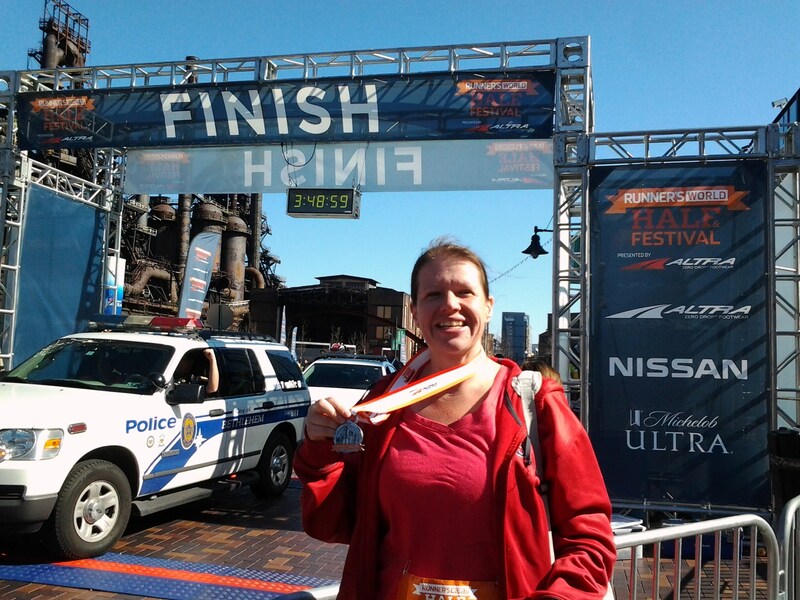 That said, soccer is over and today was the Runner’s World Half Marathon and…I did it! I still can’t believe I did it, and at times as I plodded down the streets of Bethlehem, I wasn’t sure I could do it either, but in the end I crossed the finish line at 2:49:30. Not the 2:30 I was hoping for but still under 3 hours, and that was one of my goals. Actually, I had three goals: one, to get there; two, to finish the race; and three, to finish in under 3 hours. I did all three. By the time I approached the 13 Mile marker, I wasn’t sure I had any steam left, but I had to keep going. Somehow when the finish line came into view, I found another wind and took off running. I mean, RUNNING. It was amazing, even to me. Maybe especially to me, because I knew just how tired I was. Toward the end, I did more race-walking than I wanted to do, just because my legs were dying and my knees were mad at me. But the pavement changed and the finish line was there, and the people around me cheered me on, and dammit, I poured on the last bit of steam I had and ran. The medal I got today is going to be counted among my prize possessions, along with my grandmothers’ knitting needles. Oh, and as I crossed the bridge over the Lehigh, with the Bethlehem Steel plant just down river, I blew a kiss to the spirit of my grandfather and great-grandfather, who once worked there, long long ago. As emotional as that made me feel, I almost cried when I heard my grandmother’s voice saying, “Grandpa’s watching you.” I know I didn’t run that race alone. Adding to the busy-ness, after ten months alone I have someone really special in my life. We’ve been friends for close to two years already, but last month things changed, much to my surprise. We’ve been a pretty regular thing since then, and it never fails to stun me to think, we were friends first. Just friends. All that time, I liked him but I didn’t expect anything more. Wow, am I glad there’s more. Oh, and let’s not forget the annual trip to Rhinebeck was yesterday. Thirteen-point-one miles of walking through yarn vendors’ stands. I didn’t buy a lot of yarn; for some reason, this year’s focus was on patterns and ideas. I like what I got, and the Cherry Tree Hill sock yarn I won in the “yarn trade” on the bus was sweet enough to make me feel like I really didn’t need much of anything else. That is, ’til I got the baby alpaca DK weight in a luscious shade of pumpkin/gold. It’s going to be a scarf, and it’s my reward for finishing the race today. As a side note, if the fun lady I was talking to in line at the massages is reading this–after we finished the Half–drop me a note! Us knitters/runners should stick together! And like I was saying about how running a half is like childbirth: the moment it’s over you SWEAR that no, you’ll never do that again, but give it time and later you may start thinking, “Hmm. Maybe.” I’m already thinking, “Hmm.” 🙂 Good luck at the Disney Princess Half!! Yes, ladies and gents: life IS good.